This is a sizzling summer here in Governors Harbour Eleuthera – the temperatures are HIGH and every day we say Bless You Mr Willis Carrier for inventing air conditioning ! School is out of course and plenty of children are taking part in various summer camps throughout the island. 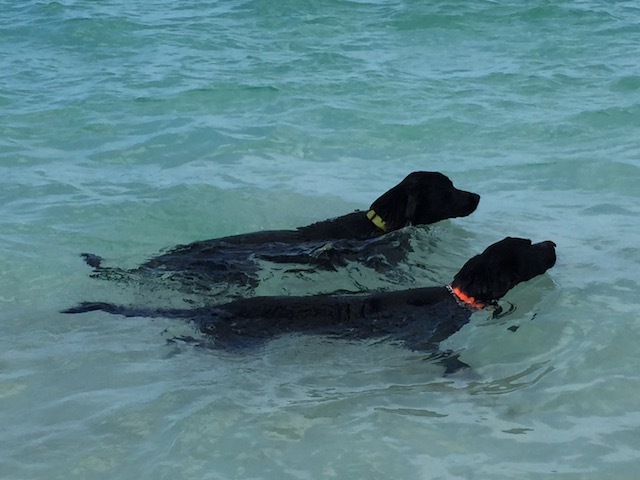 Rudge and Rufus keeping cool ! One of the Summer Camps held locally is called Project Cay – this is the third year that it has run and it is the brainchild of Daisy Crone an enterprising 18 year old from Nassau. Daisy’s family have a house here in Governors Harbour and each summer she organizes with the help of a couple friends and family a fun week of activities for 25 local children. This week they have decorated cakes, had a scavenger hunt, played on a slip and slide into Anchor Bay and had some great fun on the Basketball Court. Daisy and her team – brother Henry and good friend Zoe Dunkley- enlisted the expert help of Keno Burrows – he is originally from Nassau – although his parents are both from Cupid’s Cay. He is a professional basketball player – now playing with Fos Provence near Marseille in France. He is a great inspiration to the local kids – hearing how someone from where they live has gone on to play for different clubs around the world shows them that they too could do something like that. Just what they need ! Daisy Crone – bottom right , Henry Crone with one of the participants on his shoulders and guess which guy is Keno – yep – the tallest of them all ! Bob’s son Joel is back here agin with another Basketball Tournament as well. Friday 28th July down in Wemyss Bight at the great new court I wrote about a couple of months ago and Saturday 29th July up in Harbour Island. These sports clinics and tournaments are such a great idea – they do take a huge amount of organization – and funding as well. 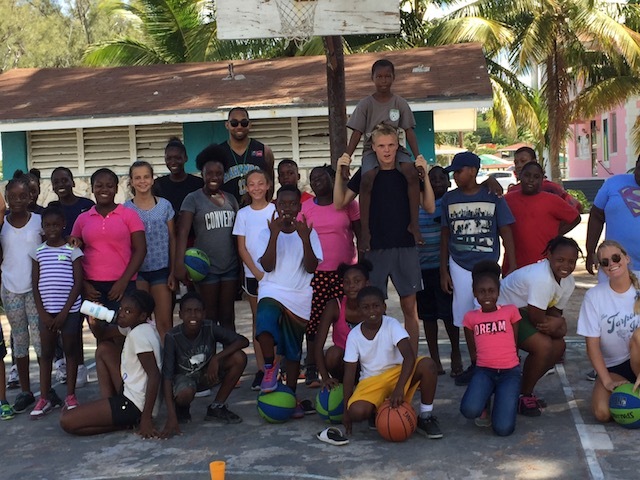 Thanks to Aliv Phones for sponsorship and also to the Pruitt family who have been visiting Eleuthera for many years for generous donation of around 80 basketballs ! 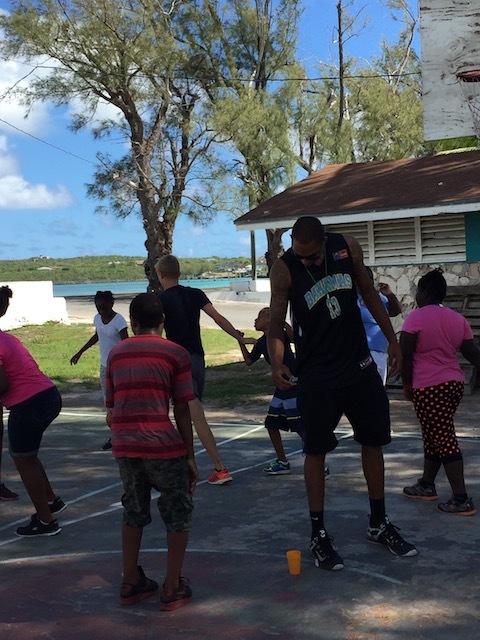 Big thanks also to Steve Bethell and his wife – local home owners here in Eleuthera – whose company donated 60 sets of playing strips. And of course huge thanks to Joel Colman for giving his time to organize and orchestrate the whole shebang ! 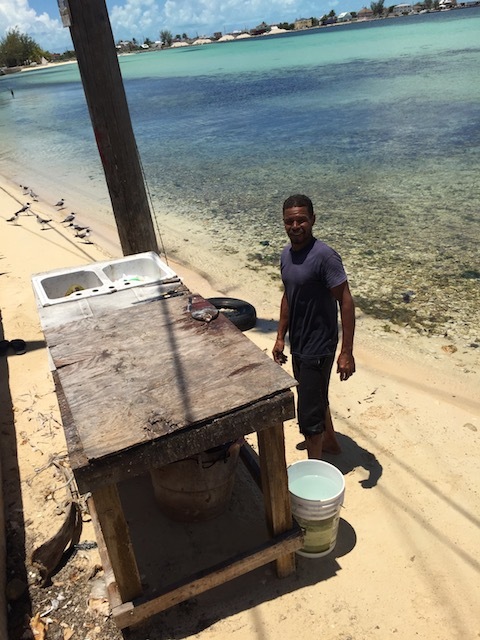 Fisherman Lindy was out getting fresh fish – thanks Lindy ! Lots of gratitude as well to the Eleuthera Island Farm for all the bread they have baked during this season. Friday is the last day for fresh bread from them – so stock up if you are here ! Tereca and Anne get up at an ungodly hour to make sure that the bread is there for 9am twice a week – kneading and mixing in the early hours so that we can all enjoy the fruits of their labors – huge thanks to them for all they have done. Please enjoy those extra hours of sleep you truly deserve ! My sister Jane, nephew Sam and his girlfriend Katy arrived here at the beginning of the week – and you all know by now how much I love having them around. Family visits here are such a treat – and with having the rental accommodation that we do it means that everyone has their own space. Already everyone is enjoying having the use of Mum’s swimming pool and she is delighted to have them hanging out with her – chatting and laughing , lounging and swimming ….. 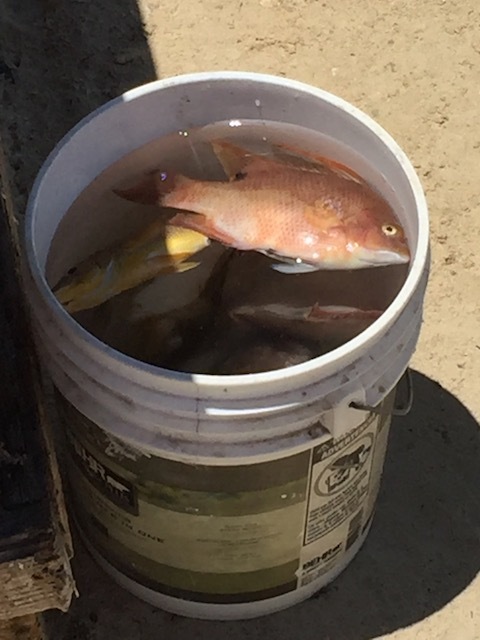 The snapper does not get fresher than this ! 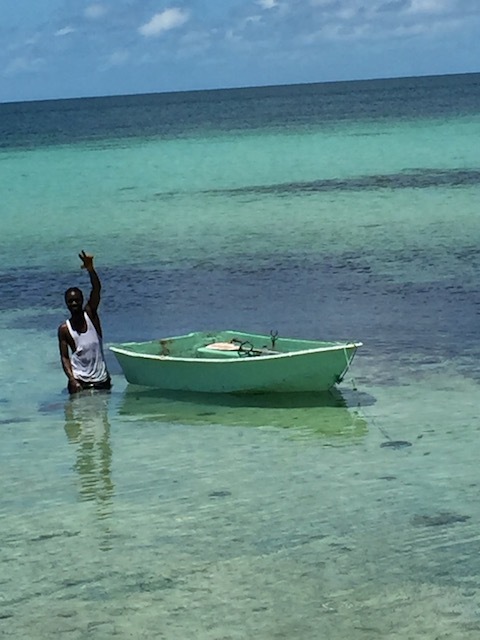 Back home again in Eleuthera. I always love reading your blog! Thanks for taking the time to keep us updated!